﻿﻿﻿﻿﻿﻿A few weeks ago I visited a temple in Hangzhou province that honours one of China's most revered generals. 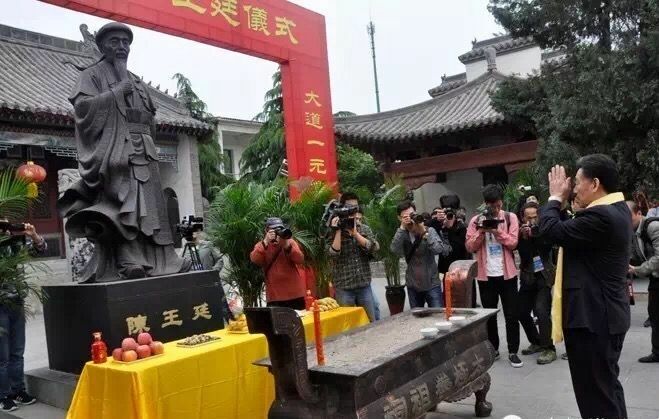 Yue Fei (1103-1142) lived in the Southern Song dynasty and his life is remembered as one of the country's greatest examples of filial piety and heroic patriotism. He has been credited as the creator of a number of martial arts including Fanziquan and Chuojiaoquan, but the two styles most associated with Yue Fei are Eagle Claw and Xingyiquan. One book states Yue Fei created Eagle Claw for his enlisted soldiers and Xingyiquan for his officers. Groomed from birth to be a warrior and to do great service for the country, his mother famously had the four characters "jin zhong bao guo" (serve the country loyally) tattooed on his back as a constant reminder to never forget his duty. The youthful Yue Fei learning the martial arts under the maxim - "Learn Diligently, Practice Bitterly"
At our recent camp with GM Chen Xiaoxing we trained alongside a quiet and serious person named Chen Hong. 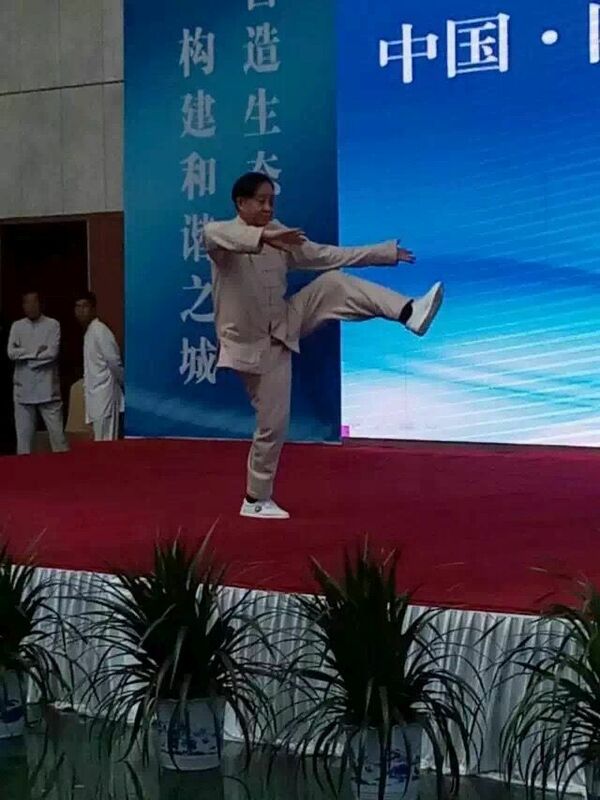 I first met him at last year's Chenjiagou Taijiquan School branch instructors' course. 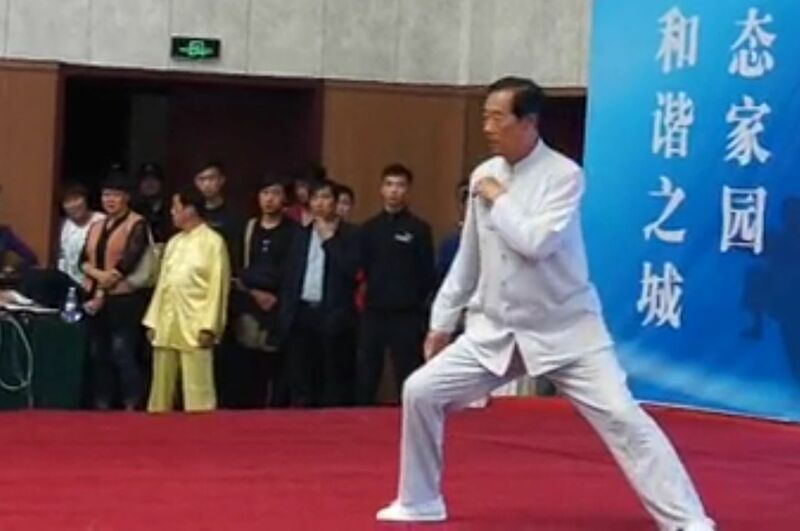 He's one of the very first group of students to train full time in the Chenjiagou Taijiquan School when it opened in 1983. More than three decades later he trained alongside our group and a new crop of Chinese students. 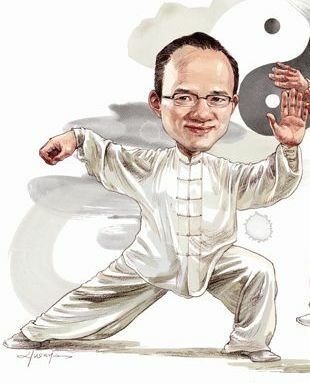 Each time Chen Xiaoxing explained or demonstrated a movement, Chen Hong observed intently, and then took himself off to a quiet corner and worked on whichever point had just been explained. 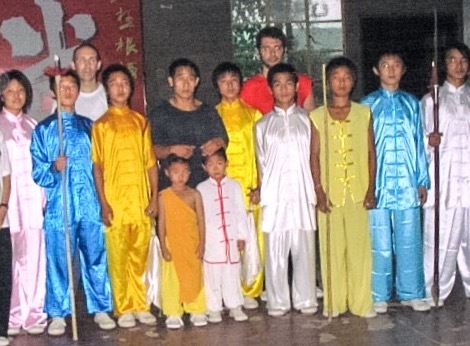 Our training trip to Chenjiagou is for the purpose of deepening knowledge and embedding skill. 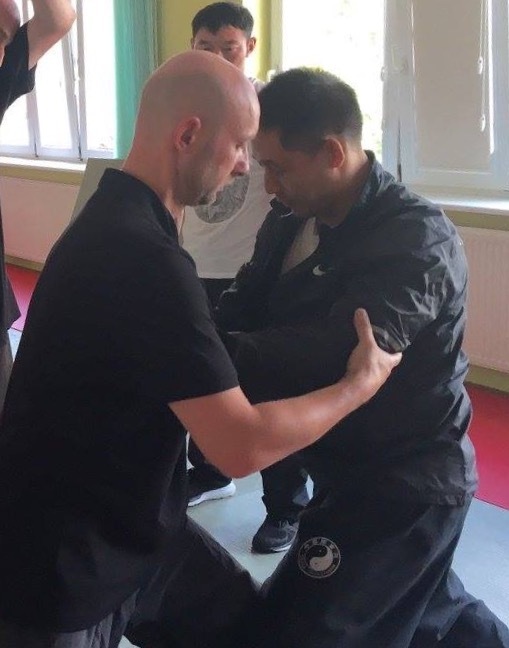 The training curriculum invariably focuses on training the fundamentals (standing pole and reeling silk exercises) and the gongfu form (Yilu) under the watchful eyes and guidance of one of the most highly skilled masters of taijiquan. Most experienced students find this training to be demanding but invaluable, and make many return visits to do the same. The inexperienced and less discerning ones may view the training as repetitive and monotonous and become impatient for more entertaining items. They have no insight into their own lack of skill and think that knowing movement patterns equals proficiency. The maxim on Yue Fei's temple struck a chord - learn diligently and train bitterly! There are no short cuts in learning the traditional art. First be clear of the correct training method. Then drill it into the body. What is required is serious, disciplined study alongside focused repetitive training. Chen Xiaoxing - "When you know you know"! 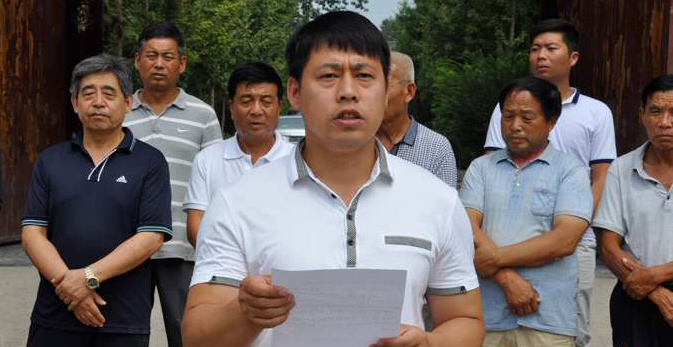 I'm writing this latest post at the end of this year's training camp in Chenjiagou with GM Chen Xiaoxing. 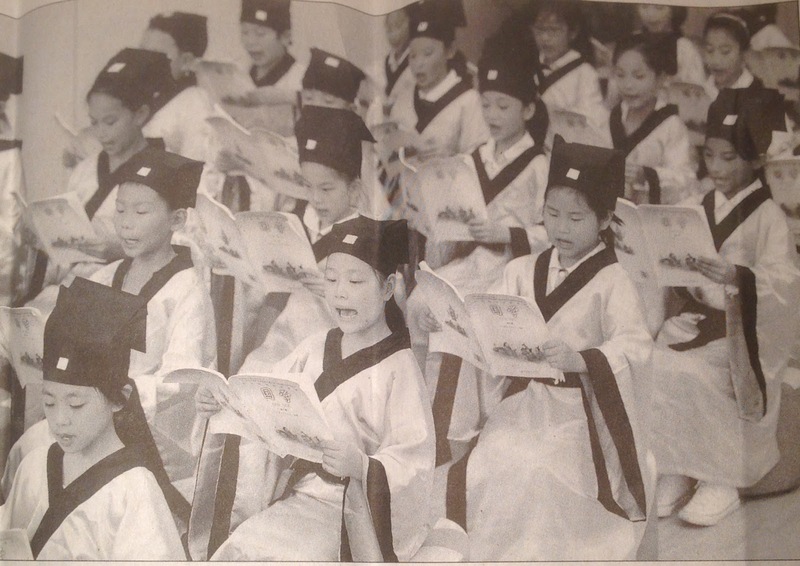 Our group was sixteen strong, plus a group of Chen Xiaoxing's Chinese students who trained alongside us. Most of our group met in Hong Kong and enjoyed a day off to shake off some of the jet lag before flying on to Chenjiagou. 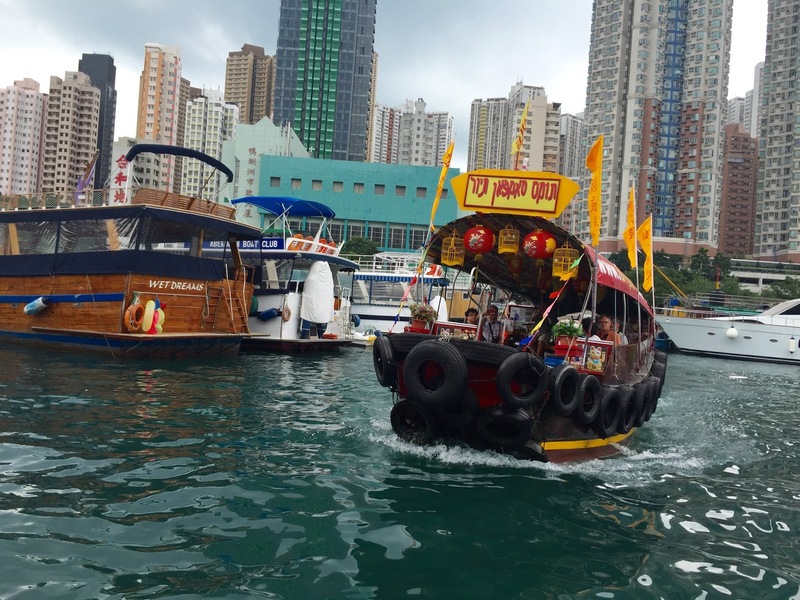 With such a short time in Hong Kong, we joined an organised tour and visited some of the "Fragrant Harbour's" iconic sites - several with links to martial arts culture: we took a sampan around Aberdeen Harbour, a location for countless local films, usually centred around the ongoing battle between the Hong Kong police force and the infamous triads. It has also been a standout location in a few international cinema classics - most notably and memorable being Bruce Lee's Enter the Dragon - where the various fighters boarded a junk bound for the mysterious Mr Han's Island; we also visited the Hong Kong Convention and Exhibition Centre (HKCEC) and the nearby Ani-Com Park. The HKCEC is a major landmark on the Hong Kong Island skyline instantly recognisable to Jackie Chan fans as the setting for the dramatic ending of New Police Story; Ani-Com Park opened earlier this year as Hong Kong's first selfie theme park and features life-sized statues based on 30 classic Hong Kong animation and comic characters including Hero Wah, Andy Chan, Bruce Lee, Old Master Q etc...; Repulse Bay, located in the southern part of Hong Kong Island, and whose name comes from a 19th century battle in which the British army repulsed attacking pirates that infested the area. A colourful Daoist temple flanked by the giant statues of Tin Hau (Goddess of the Sea) and Kwun Yum (Goddess of Mercy). 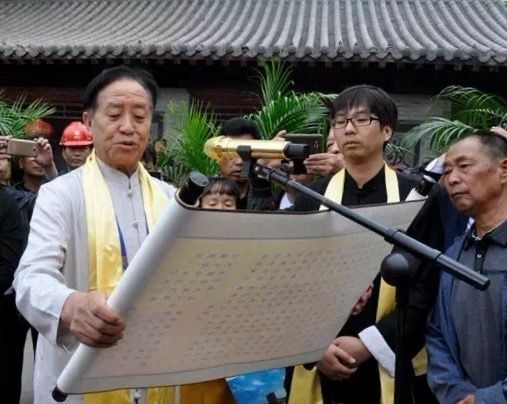 Westerners are always a bit perplexed at the seeming randomness of Daoist temples. Here we were met with colourful mosaic statues of folk deities including the God of Love , the Fish God and the God of Wealth, and creatures like dragons, goldfish and rams. The next day we flew into Chenjiagou. For the first time trained at Chen Ziqiang's new seven storey accommodation/training facility. At first sight it would be easy to be misled by the facade and entrance - marble floored with four floors of comfortable accommodation. Above, though, hidden from the outside world are three floors of cavernous, spartan training areas. On the few days when it rained and the latest batch of the school's recruits were put through their paces above us, the building seemed to shake as their efforts echoed through the building. 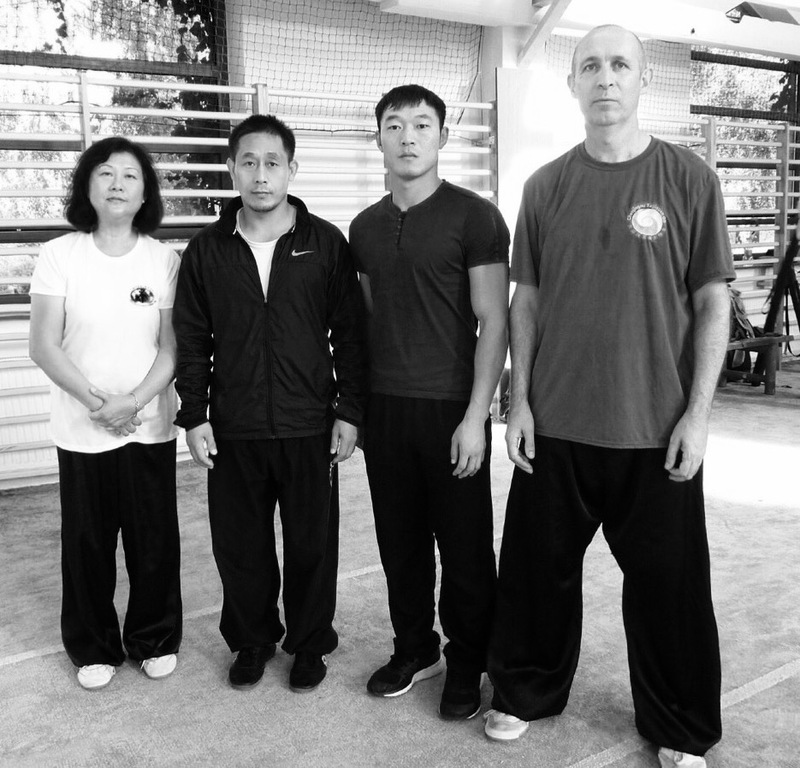 For ten days we settled into a daily routine of two sessions of two and a half hours with GM Chen Xiaoxing. Each session started with jibengong (basic training) consisting of zhan zhuang (standing pole) and chansigong (reeling silk). Then, a few moves at a time, deepening of the Laojia Yilu routine - referred to in Chenjiagou as the "mother form" or the "gongfu form". There is a Confucian adage that says "a mirror doesn't lie, it simply tells the truth". It reflects exactly what is before it. Basic training with Chen Xiaoxing is a gruelling and repetitive business. With standing, for instance, he corrects each student in turn, adjusting and leading them into a better structural position - at the same time dramatically increasing the demands on the legs. 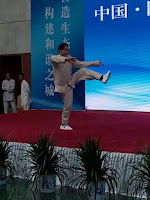 The lack of adequate leg strength is one of the limiting factors on the ability to "fang song" or loosen the body to the degree required by Chen Taijiquan. Over the course of each session every student would be corrected two or three times before Chen Xiaoxing brought the standing to a close with a clap of his hands after thirty or forty minutes. That's being corrected approximately fifty times over the course of the ten days. Anyone who didn't have a better idea of what to work on when they went home just wasn't paying attention! Reeling silk training involved another half an hour continuously drilling a single movement, trying to remain completely level with the upper body compact and unbroken whilst going through the exercise. 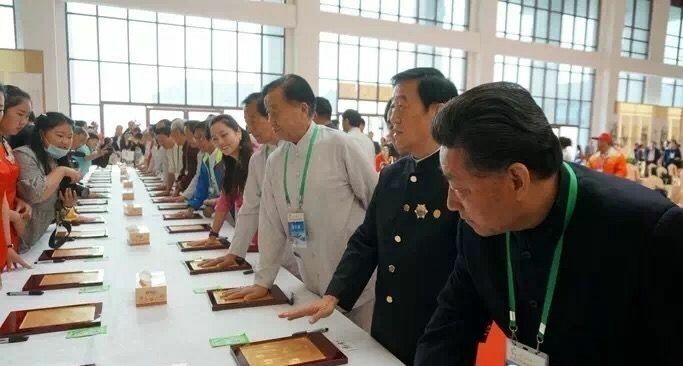 After one challenging session Chen Xiaoxing remarked that, "the training my senior students "fear" the most are standing and reeling silk". 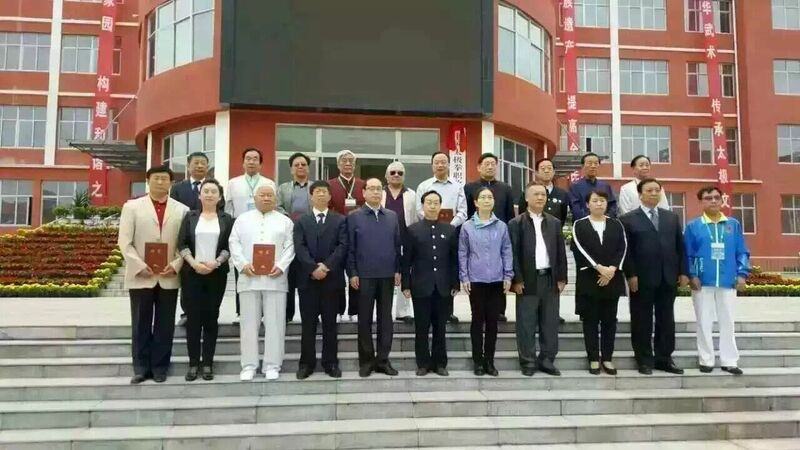 Chen Xiaoxing is a great believer in developing a deep foundation through this kind of simple basic training and have little patience for abstract speculation and talk. When one of the Chinese students, rubbing his painful legs after one session of zhan zhuang, asked him, "how will I know when I find the right feeling?" His short, simple yet profound answer, "you know when you know. When you don't know, you don't know". 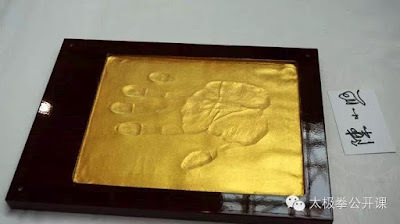 Bruce Lee biopic - filming begins in Chenjiagou! Shooting officially began on the new Bruce Lee biopic "Birth of the Dragon" on the 11th April in Chenjiagou. The film tells a fictional story of Lee's life before he became an international movie star, culminating in his well-documented challenge against Kung Fu master Wong Jack Man in San Francisco in 1965. As reported in an earlier post, the film is being directed by George Nolfi, whose past successes include The Bourne Ultimatum and The Adjustment Bureau. It tells the story of how Lee was deeply influenced by Taiji culture and received instruction in Taijiquan enabling him to bring his martial arts understanding to a high point. In the movie Wang Xian plays the part of Bruce Lee's Taijiquan master - in reality he learned the art from his father in Hong Kong. Before shooting began, a number of trips were made to scout out the best locations for the early part of Lee's story - eventually deciding upon locations in Jiaozuo, Wenxian and in the scenic area of Yuntaishan. The cast was finalised, Hong Kong born American actor and martial artist and action choreographer Philip Ng Wanlung playing Bruce Lee; Xia Yu plays Wong Jack Man and, as mentioned previously Wang Xian takes the role of Lee's Taijiquan master - with students from his school acting as extras in the movie. Director George Nolfi overseeing proceedings in the garden where Yang Luchan learned from Chen Changxin. Wang Xian - movie star! As well as promoting Chinese martial arts, Birth of the Dragon introduces the world to Taijiquan's birthplace Chenjiagou. The film is expected to be released in 2017. 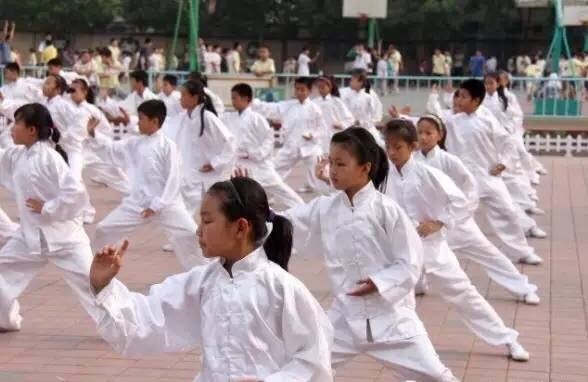 A few days ago I watched a documentary about a young English guy's experience training karate in Okinawa and saw a number of parallels with the hurdles facing western students of Taijiquan. The student in the film was in his early thirties - fit, strong and obviously committed, with a love for the art he was practising. In spite of this, his exasperated teacher berated him for not "trying" hard enough. The teacher wasn't questioning the sweat and effort of his foreign student, but his lack of progress in understanding more than the face appearance of techniques he had trained for several years. One of the things he was struggling with was the basic block or "uke". Having trained karate for a decade from my mid teens, much of the time with Japanese instructors, I trained the same technique thousands of times confident that I understood it. All these years later it was telling to see the Okinawan instructor explaining to the camera that Japanese was a subtle and highly nuanced language. While the word uke literally means to block, it also hints at the qualities of receiving or accepting. He wanted his student to face his opponent and advance unhesitatingly, but at the same time to merge with the attack rather than just try to overpower the other person. 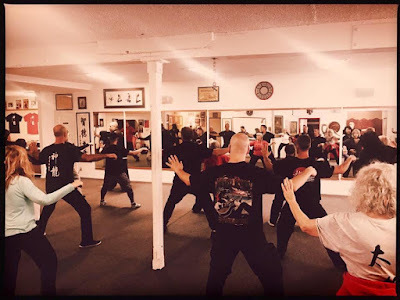 Taijiquan asks its exponents to "welcome" an attack. Not to simply learn rote applications, but to train the ability to "listen" to, connect with and redirect an opponent's movements. In real time, dealing with an attack, the speed and suddenness of an accomplished practitioner's finishing movement makes almost invisible the preceding connecting and neutralising phase. Chen Xiaoxing: "Try to understand the multiple layers within a technique". I remember Chen Xiaoxing telling a student not to underestimate the importance of hard physical training but also to try to understand the multiple layers contained within a technique. Taijiquan is built upon a complex philosophy and methodology that is often misinterpreted and misunderstood. Chinese Whispers, a Facebook page posting ""Whispers" from the Taijiquan/Internal Arts community in China. Interpretations. Reflections. Observations. 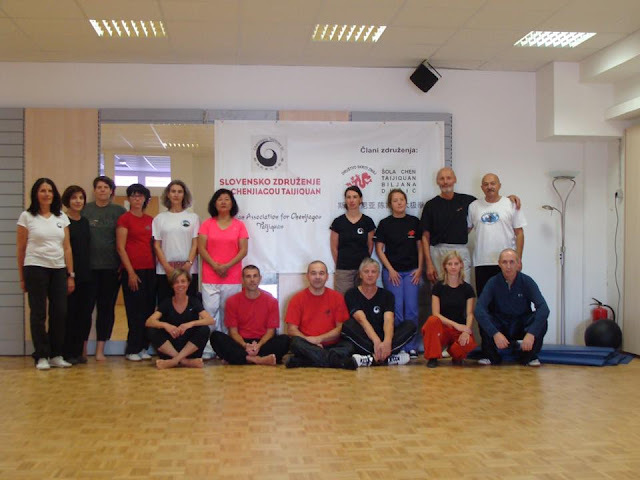 Commentaries...", asked the question what is the most difficult aspect of Taijiquan? The article answered with the following passage: "The best answer is in Lao Zi's Daodejing Chapter 41 - that explains that "contradiction is the dynamic expression of the law of nature". Taijiquan is a typical example of contradictory dialectics: its fundamental principles exist in contradictions and paradoxes and if they are not viewed as a dialectical unity - if you insist that a circle is a circle, a straight line is a straight line, that what are opposites can never be reconciled or that they cannot complement each other - then the theory of Taijiquan will not become clear".